Attorney General Holder Jokes That Republicans Have 'A New Fondness For Me' : It's All Politics The Senate has delayed confirming Holder's successor, Loretta Lynch. Democratic Sen. Richard Durbin says Lynch has been "asked to sit in the back of the bus when it comes to the Senate calendar." 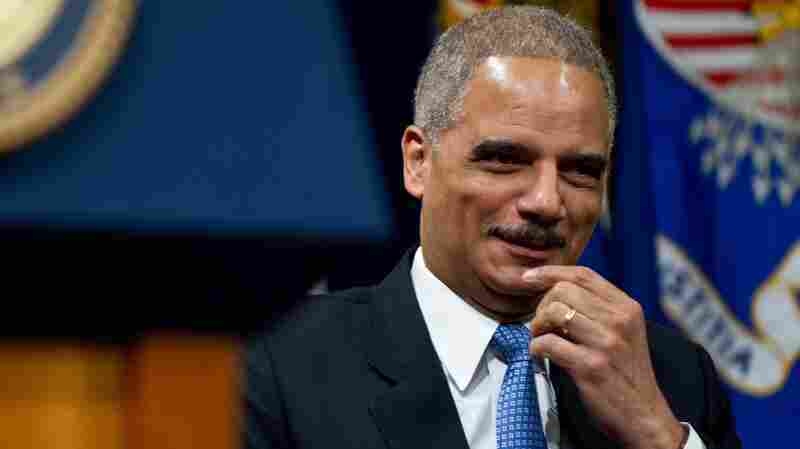 Attorney General Eric Holder has endured a rocky relationship with lawmakers during his tenure. But he's all they have until his successor is confirmed. Attorney General Eric Holder joked Wednesday that given nearly six months of Senate delays in confirming his successor at the Justice Department, "it's almost as if the Republicans in Congress have discovered a new fondness for me." "I'm feeling love there that I haven't felt for some time. And where was all this affection the last six years?" the attorney general asked, to laughter, in brief remarks at the Center for American Progress in Washington. Holder has endured a rocky relationship with lawmakers during his tenure. 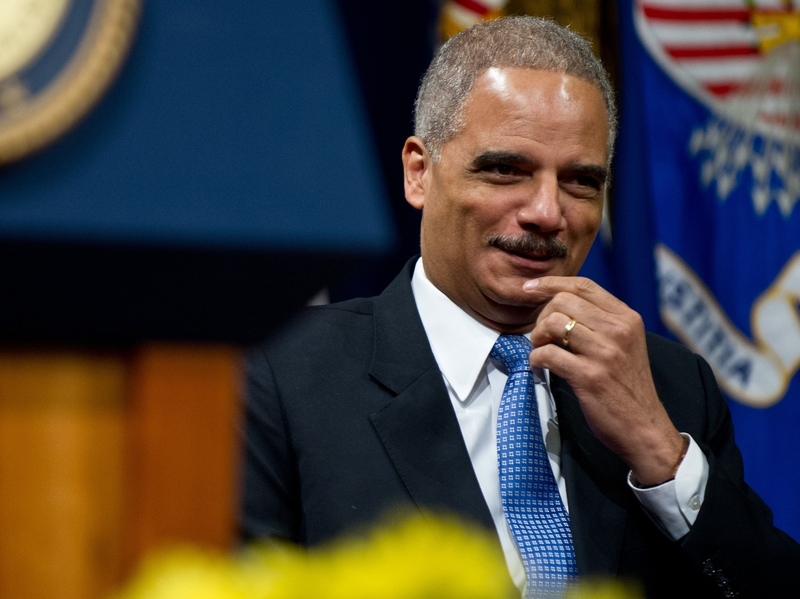 In 2012, he became the first attorney general to be held in contempt by the GOP-controlled House of Representatives over his refusal to turn over documents in the "Fast and Furious" gun-trafficking scandal. But even though he announced his intention to resign in September 2014, Senate leaders have slow-walked the confirmation process for his would-be replacement, Brooklyn U.S. Attorney Loretta Lynch. The White House this week said Lynch, who had twice been confirmed to other top law enforcement posts with no negative votes, had waited 130 days for the full Senate to take action on her nomination to be the country's chief law enforcement officer — longer than the previous five attorney general nominees combined. Senate Majority Leader Mitch McConnell, R-Ky., has said he will work to move ahead with a human trafficking bill before scheduling a floor vote for Lynch. Since the Senate next week may consider budget issues, and then take a two-week break, action on the attorney general nomination may wait until mid-April. If she's approved, Lynch would be the first African-American woman to run the Justice Department. Lynch herself is relatively noncontroversial, but she has suffered in part because of conservative displeasure about President Obama's executive action on immigration. Sen. Richard Durbin, a high-ranking Illinois Democrat, took to the Senate floor Wednesday morning under a poster of Lynch to complain that "no one laid a glove on her" during her eight-hour-long hearing in the Senate Judiciary Committee. Durbin said "there's no good reason" for the lengthy delays and said she has been "asked to sit in the back of the bus when it comes to the Senate calendar." Through spokesman Brian Fallon, Holder reiterated his commitment to stay in office until the Senate moves on his successor. "In case it's lost on GOP, Holder is staying til Lynch confirmed. The longer Senate delays, the longer he is AG," Fallon tweeted.